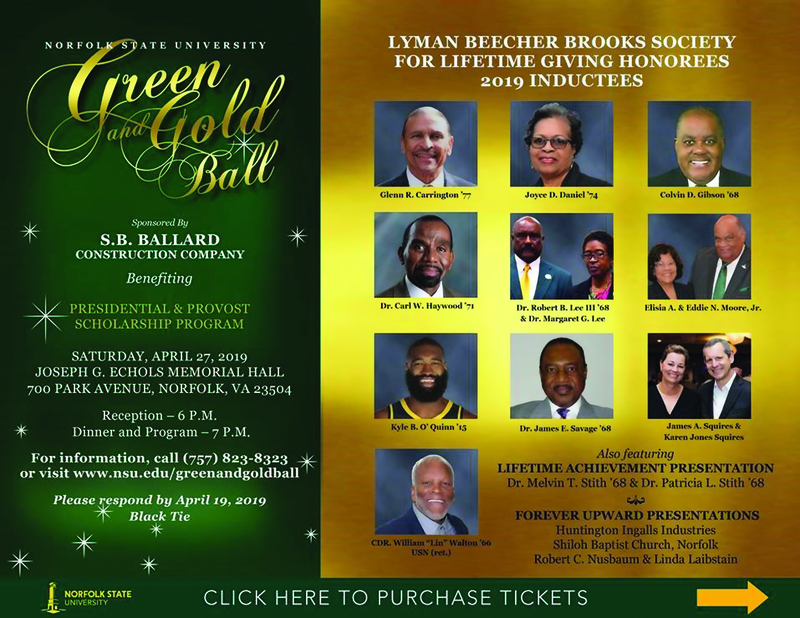 Norfolk State University will induct 13 generous and deserving donors —all who have gifted at least $100,000 in their lifetime to the institution— into the prestigious Lyman Beecher Brooks Society at the 2019 Green and Gold Ball on April 27 at 7 p.m. at Joseph G. Echols Memorial Hall on campus. The event will be held to support the university’s presidential and provost scholarship program at the institution. The evening is expected to provide an opportunity for students, faculty, alumni and friends to join on campus for fellowship, mentorship and to honor supporters who have been the most charitable in helping to advance NSU’s 84 years in higher education. The event will be a night of celebration and scholarship, and will be anchored by live entertainment and a student art showcase in support of the university. Former Norfolk State Student and Actor J.B. Smoove will serve as the special guest emcee for the ceremony. Smoove, known as Jerry Angelo Brooks while on campus, has appeared in popular movies and cult classic films such as “Uncle Drew” and “Pootie Tang.” The actor, who has more than 70 film and television credits, is also known for his role as “Leon” on the hit HBO comedy, “Curb Your Enthusiasm,” and most recently served as honorary grand marshal during Norfolk State’s 2018 Homecoming Parade. The donors entering the society in 2019 are made up of several notable alumni, such as NBA Player Kyle O’Quinn and former administrators such as NSU President Eddie N. Moore, Jr., and his wife, Elisia A. Moore. This year’s honorees also include NSU School of Business Dean Glenn R Carrington ’77, Joyce D. Daniel ’74, Colvin D. Gibson ’68, NSU Chief of Staff Dr. Carl W. Haywood ’71, Dr. Robert B. Lee III ’68 and Dr. Margaret Lee, Dr. James E. Savage ’68, James A. Squires and Karen Jones Squires and retired U.S. Navy CDR William “Lin” Walton ’66. In addition to the honorees, the university will present a lifetime achievement award to NSU Interim President Melvin T. Stith, Sr., Ph.D. and his wife, Dr. Patricia Lynch Stith. The university will also present its “Forever Upward” award to Robert C. Nusbaum (deceased) and Linda Laibstain; Shiloh Baptist Church; and Huntington Ingalls Industries for their philanthropic support of the institution and its students. Tickets for the event are $150. To purchase tickets online, visit https://alumnirelations.nsu.edu/2019GGBall. For more information about the Green and Gold Ball, contact the NSU Office of University Advancement at (757) 823-8323. Tags: Ball, donor, fund raising, Green and Gold, honorees, J.B. Smoove, Norfolk State, NSU. Bookmark the permalink.